In marathon-running terms, this is the phoney war. I write this sitting at my desk at work in Salford Quays on my meal break, with nothing but a gentle ache from running the five kilometres to work earlier on and a sense of anticipation about the adventure that’s about to begin. Actually, that’s not true at all. Runners are just about the most hypochondriac group of people you’ll ever come across. One of the main benefits of being in a running club is having a group of people to whom you can answer honestly when they ask “How are you?” without fear of boring them to death. I’d say pretty much any runner of any size, shape, or form – whether training for their first fun run or preparing for an ultra marathon – will always have some part of their body they’re not particularly happy with. Basically it can be narrowed to three main causes: it’s something that’s stopped them from running, it’s something that hasn’t stopped them from running but means they can’t run as fast as they would like, or else it’s something that they’re worried ‘might’ stop them from running. Failing that, it’ll be something that they’re worried might stop them from running as fast as they would like. Or as far as they would like. You get the picture. So, since you didn’t ask, I’m sitting here with a dull pain in my lower back. It was terribly icy on Friday night and, on the way back from celebrating my 40th birthday at about 4am, I came round the corner of my street and felt my feet start spinning round like a cartoon character about to set off on an epic chase. I just about managed to stay upright but I’m fairly worried I’ve jarred something in my back. This isn’t good, because about 11 months ago I basically broke myself through Too Much Running. I only took it halfway seriously in April 2013, a month after being diagnosed with Type 2 diabetes due to needing to get fitter and lose some weight. I joined my local club (Chorlton Runners) and was surprised and overjoyed to find out how much easier running was with a group of friendly people. I lost the weight, kept it off, managed to avoid going on tablets for my diabetes, and started to improve. 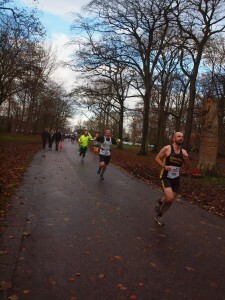 My first club run was eventually followed by my first 5K park run, fell running, my first competitive 10K, my first sub-20 minute 5K, my first half marathon…it was all going surprisingly well. I’d gradually got better and better and faster and faster. So I thought, I know, I’ll go along with everyone else and train for the Manchester Marathon. I pretty much fell off a cliff. My legs had got stronger and faster, but the rest of me hadn’t. A tight ITB (the illiotibial band, a kind of shock absorber on your thigh that connects your knee to everything above it) gave me Runner’s Knee, there were complications due to the way I sat at work affecting my back, and by the middle of January even two miles worth of running left me in agony. I had to stop training and rest, and by the end of the month it became clear the only sensible thing to do was defer my marathon entry while I still could. I’ve been trying to fix myself ever since. 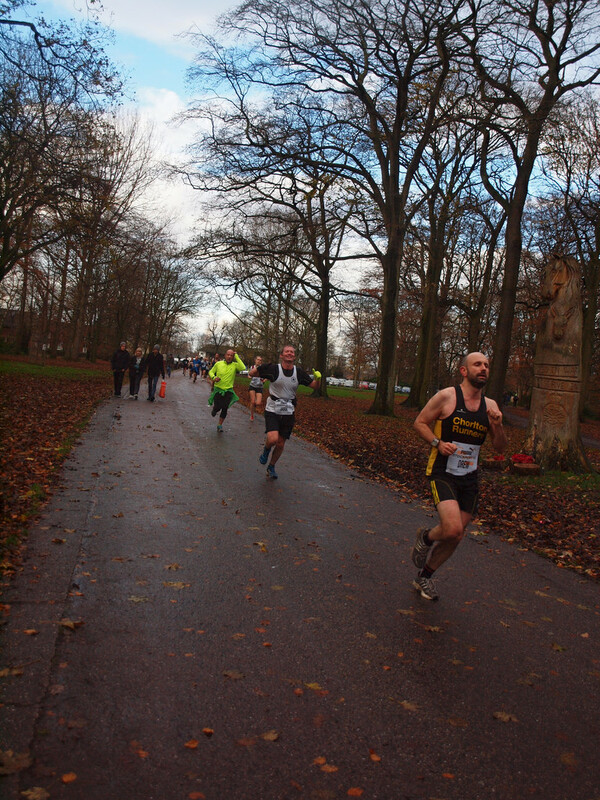 Thanks to a lot of persistence and a very good physiotherapist, I thought I’d finally got there in the last few weeks – my hips had levelled up, my back was OK, my glutes were firing again and although I wasn’t as fast as I had been, the Stockport 10 miler at the end of November was the first road race I’d really enjoyed this year…particularly nailing the last kilometre of it at 5K PB pace. Not bad, considering it was only the third time I’d run that far since I gave up marathon training last time. Which is why I’m sitting here and worrying about my back, and whether I’ve knocked myself out of alignment given the fact I seemed to be running diagonally on the way to work earlier. All I can do is sit here and wait for Gavin (our club coach, also known as The Dark Lord for his ability to dish out pain and suffering – more of him later, I’m sure) to publish our training schedule, and hope that this time I’ll manage to get through it. I’m sure I will – somehow. Anyway, we’re going on a journey – and it won’t be all about injuries and training and PBs, I promise. Well, it will, a bit – but like anything I do, it’ll be kind of about everything else at the same time. So I look forward to having your invisible company to help keep me going on what looks like a very long road ahead. Please, don’t take *any* medical or coaching advice from me. I’m not qualified and all I can do is repeat what I’ve been told by people who seem better informed, and pass on the mistakes I’ve made in the hope that you don’t make them too.